NASA astronaut Serena Auñón-Chancellor conducts research operations for the AngieX Cancer Therapy study inside the Microgravity Science Glovebox. The new cancer research seeks to test a safer, more effective treatment that targets tumor cells and blood vessels. In the background, NASA astronaut Drew Feustel can be seen working on the Microgravity Investigation of Cement Solidification (MICS) 2 experiment aboard the International Space Station. MICS 2 is researching how cement reacts in space during the hardening process and may help engineers better understand its microstructure and material properties. NASA will host a media teleconference at 1 p.m. EST Thursday, Nov. 8, to discuss select science investigations and technology demonstrations launching on the next Northrop Grumman commercial resupply flight to the International Space Station. Audio of the teleconference will stream live on NASA’s website. 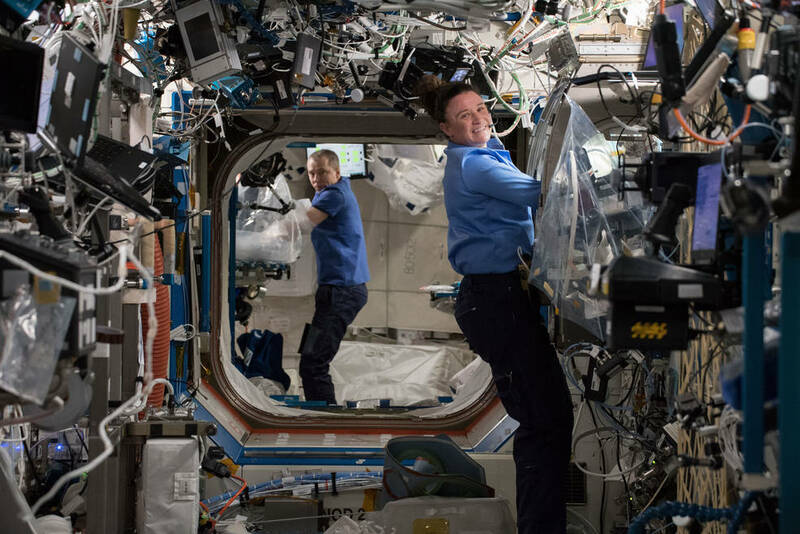 Tara Ruttley, associate chief scientist for Microgravity Research in NASA’s Office of Chief Scientist, and Liz Warren, associate program scientist for the station’s National Lab, will provide an overview of the research and technologyaboard Northrop Grumman’s Cygnus spacecraft. Laurence Harrisis a professor at York University in Toronto and principle investigator for research to develop, in collaboration with the Canadian Space Agency, a mathematical model for how an astronaut’s perception of motion, body position and distance to objects changes in space. Marco Baptistawith the Michael J. Fox Foundation in New York is the principle investigator for a National Lab investigation to evaluate growth of protein crystalsimplicated in Parkinson’s disease. Crystals grown in space are larger, enabling more detailed analysis to help define the protein’s exact shape and morphology and help scientists better understand the disease’s pathology. Negar Rajabiat Cemscia, LLC, is principle investigator for National Lab research to test a novel approach of using particles of calcium-silicate to synthesize membranesas thin as a human hair. These particles can separate carbon dioxide molecules from air or other gases, technology that could aid in removing carbon dioxide from waste gases to reduce greenhouse gas emissions. To participate in the teleconference, media must contact Joshua Finch at 202-358-1100 or joshua.a.finch@nasa.gov by 10 a.m. Nov. 8 for dial-in information. Northrop Grumman is targeting Thursday, Nov. 15, for its 10th contracted mission under NASA’s Commercial Resupply Services contract. The Cygnus spacecraft will launch on an Antares rocket from the Mid-Atlantic Regional Spaceport’s pad 0A at Wallops Flight Facility in Wallops Island, Virginia, carrying scientific research, crew supplies, and hardware to the orbiting laboratory to support the station’s Expedition 57 and 58 crews.